2018-02-02 First worldwide family litigation filed litigation Critical https://patents.darts-ip.com/?family=41114885&utm_source=google_patent&utm_medium=platform_link&utm_campaign=public_patent_search&patent=WO2010008964(A1) "Global patent litigation dataset” by Darts-ip is licensed under a Creative Commons Attribution 4.0 International License. Provided are various compositions, including but not limited to a bimodal polyethylene composition having a density of 0.940 g/cc or more, the composition comprising a high molecular weight polyethylene component and a low molecular weight polyethylene component, wherein the composition qualifies as a PE 100 material such that in accordance with ISO 1167 a pipe formed from the composition that is subjected to internal pipe resistance has an extrapolated stress of 10 MPa or more when the internal pipe resistance curve is extrapolated to 50 or 100 years in accordance with ISO 9080:2003(E), and wherein the melt strength is greater than 18 cN. This application claims the benefit of Serial No. 61/135,036, filed July 16, 2008, the disclosure of which is incorporated by reference in its entirety. Embodiments of the present invention generally relate to compositions containing polyethylene, particularly bimodal polyethylene compositions. Ongoing efforts have been directed to making polyolefin pipe compositions, particularly high density polyethylene pipe compositions. A goal is for the resin to be made economically and efficiently, while providing a pipe with a desirable balance of properties. U.S. Patents Nos. 7,037,977, 6,090,893, and 7,193,017, and U.S. Patent Application Publications Nos. US 2007/027611, US 2004/0157988, and US 2005/0234197 relate to polyethylene pipe resins. There is a need for a high strength polyethylene composition exhibiting a desirable balance of properties including in a class of embodiments a higher melt strength. In accordance with one aspect of the invention, there is provided a high density bimodal polyethylene composition having a density of 0.940 g/cc or more, the composition comprising a high molecular weight polyethylene component and a low molecular weight polyethylene component, wherein: the composition qualifies as a PE 100 material such that in accordance with ISO 1167 a pipe formed from the composition that is subjected to internal pipe resistance has an extrapolated stress of 10 MPa or more when the internal pipe resistance curve is extrapolated to 50 or 100 years in accordance with ISO 9080:2003(E); and the composition has a melt strength is greater than 18 cN. In one embodiment, the high and low molecular weight polyethylene components are formed in a single reactor. In one embodiment, the melt strength is greater than 20 cN. In another embodiment, the melt strength is greater than 22 cN. In one embodiment, the complex viscosity at 0.01 s-1 is greater than 3.5*105 Pa-s. In another embodiment, the complex viscosity at 0.1 s-1 is greater than 1.5* 105 Pa-s. In one embodiment, the overall PDI is from 15 to 40. In one embodiment, the high molecular weight component is present in an amount of 45 to 60 wt% based upon the total weight of the composition. In one embodiment, the average molecular weight (Mw) of the low molecular weight polyethylene component is from 5,000 to 35,000. In one embodiment, the average molecular weight (Mw) of the high molecular weight polyethylene component is from 400,000 to 700,000. In one embodiment, the ratio of the weight average molecular weight of high molecular weight component to the weight average molecular weight of low molecular weight component (MwHMW:MwLMW) is 15 to 40 : 1. In one embodiment, the FI (I21) of the composition is from 4 to 10 g/10 min. In one embodiment, the high molecular weight polyethylene component has a density of 0.945 or less. In one embodiment, the low molecular weight polyethylene component has a density of 0.940 or more. In one embodiment, the high molecular weight polyethylene component includes a polyethylene that includes a comonomer being butene, hexene, octene, or mixtures thereof, wherein the comonomer is present in the amount of more than 1.0 wt% of the polyethylene. In one embodiment, the low molecular weight polyethylene component includes a polyethylene that includes a comonomer being butene, hexene, octene, or mixtures thereof, wherein the comonomer is present in the amount of less than 3.0 wt% of the polyethylene. In one embodiment, the extrapolated stress is 10.5 MPa or more when extrapolated to 50 or 100 years in accordance with ISO 9080:2003(E). In one embodiment, wherein the high and low molecular weight polyethylene components are formed by gas phase polymerization. In one embodiment, the high and low molecular weight polyethylene components are formed by slurry phase polymerization. In one embodiment, the composition is made from polymerization conducted in the presence of a bimodal catalyst system that includes a metallocene based catalyst. In one embodiment, the high and low molecular weight polyethylene components are formed from polymerization conducted in the presence of a bimodal catalyst system that comprises bis(2-trymethylphenylamido)ethyl)amine zirconium dibenzyl. In one embodiment, the high and low molecular weight polyethylene components are formed from polymerization conducted in the presence of a bimodal catalyst system that comprises (pentamethylcyclopentadienyl)(n- propylcyclopentadienyl) zirconium dichloride. In one embodiment, the high and low molecular weight polyethylene components are formed from polymerization conducted in the presence of a bimodal catalyst system that comprises (tetramethylcyclopentadienyl)(n- propylcyclopentadienyl)zirconium dichloride or (tetramethylcyclopentadienyl)(n- propylcyclopentadienyl)zirconium dimethyl. In one embodiment, the high and low molecular weight polyethylene components are formed from polymerization conducted in the presence of a bimodal catalyst system that comprises bis(2- pentamethylphenylamido)ethyl)zirconium dibenzyl or bis(2- pentamethylphenylamido)ethyl)zirconium dimethyl. Any of the catalysts disclosed above may be combined to form a bimodal or multimodal catalyst system as discussed in more detail below. Figure 1 is a graph showing the dynamic viscosity of three samples according to a class of embodiments of the invention and of five commercial samples. Figure 2 is a graph showing the Rheotens melt strength versus pull-off speed for two samples according to a class of embodiments of the invention and of four commercial samples. Figure 3 is a graph showing a molecular weight distribution (MWD) curve taken of a bimodal product (sample 1163-18-1) according to an embodiment of the invention, using the SEC technique described herein (GPC method). Before the present compounds, components, compositions, and/or methods are disclosed and described, it is to be understood that unless otherwise indicated this invention is not limited to specific compounds, components, compositions, reactants, reaction conditions, ligands, metallocene structures, or the like, as such may vary, unless otherwise specified. It is also to be understood that the terminology used herein is for the purpose of describing particular embodiments only and is not intended to be limiting. It must also be noted that, as used in the specification and the appended claims, the singular forms "a," "an" and "the" include plural referents unless otherwise specified. Thus, for example, reference to "a leaving group" as in a moiety "substituted with a leaving group" includes more than one leaving group, such that the moiety may be substituted with two or more such groups. Similarly, reference to "a halogen atom" as in a moiety "substituted with a halogen atom" includes more than one halogen atom, such that the moiety may be substituted with two or more halogen atoms, reference to "a substituent" includes one or more substituents, reference to "a ligand" includes one or more ligands, and the like. For purposes of convenience, various specific test procedures are identified for determining properties such as average molecular weight, extrapolated stress, polydispersity index (PDI), flow index (FI) and melt flow ratio (MFR). However, when a person of ordinary skill reads this patent and wishes to determine whether a composition or polymer has a particular property identified in a claim, then any published or well-recognized method or test procedure can be followed to determine that property (although the specifically identified procedure is preferred, and that any procedure specified in a claim is mandatory, not merely preferred). Each claim should be construed to cover the results of any of such procedures, even to the extent different procedures may yield different results or measurements. Thus, a person of ordinary skill in the art is to expect experimental variations in measured properties that are reflected in the claims. All numerical values can be considered to be "about" or "approximately" the stated value, in view of the nature of testing in general. Density is a physical property of a composition, is determined in accordance with ASTM-D-1505, and is expressed as grams per cubic centimeter (or grams per milliliter). Except to the extent the actual density is specified, the term "high density" means any density of 0.940 g/cc or above, alternatively 0.945 g/cc or above, alternatively 0.950 g/cc or above, and alternatively still 0.960 g/cc or above, and an illustrative range of a high density composition is from 0.945 g/cc to 0.967 g/cc. The term "polyethylene" means a polymer made of at least 50% ethylene-derived units, preferably at least 70% ethylene-derived units, more preferably at least 80% ethylene-derived units, or 90% ethylene-derived units, or 95% ethylene-derived units, or even 100% ethylene-derived units. The polyethylene can thus be a homopolymer or a copolymer, including a terpolymer, having other monomeric units. A polyethylene described herein may, for example, include units derived from a co-monomer that is preferably an α-olefin, e.g., propylene, 1-butene, 1-pentene, 1-hexene, 1-octene, or mixtures thereof. Other embodiments may include dienes, ethacrylate, or methacrylate. The term "composition" (e.g., polyethylene composition) itself broadly means any material that includes polyethylene, and may encompass any blended composition that includes not only the bimodal polyethylene described herein, but also other polymers and optionally additives, e.g., carbon black, and preferably includes additives used in making pipe resin. A composition may be either a "blend" (blended) composition, which can include other polymers, e.g., other polyethylenes or non-polyethylenes, or an "unblended" composition, which does not include other polymers. In certain embodiments, the term "polyethylene composition" consists of the bimodal polyethylene alone, while in other embodiments, the term "polyethylene composition" consists essentially of the bimodal polyethylene, i.e., lacking significant quantities of other materials, e.g., less than 5 wt% of other polymers. However, a composition that includes non- polymer additives such as carbon black is still regarded as a composition consisting essentially of a bimodal polyethylene. The term "bimodal," when used herein to describe a polymer or polymer composition, e.g., polyethylene, means "bimodal molecular weight distribution," which term is understood as having the broadest definition persons in the pertinent art have given that term as reflected in one or more printed publications or issued patents. At least one example of a bimodal polyethylene is shown in Figure 3, in which the horizontal axis is expressed as the log of the molecular weight (Log MW). For example, a composition that includes a polyethylene component with at least one identifiable higher molecular weight and a polyethylene component with at least one identifiable lower molecular weight, e.g., two peaks (as displayed in Figure 3), is considered to be a "bimodal" polyethylene, as that term is used herein. A material with more than two different molecular weight distribution peaks will be considered "bimodal" as that term is used herein although the material may also be referred to as a "multimodal" composition, e.g., a trimodal or even tetramodal, etc. composition. As noted below, various different types of processes, and reactor configurations, can be used to produce a bimodal polyethylene composition, including melt blending, series reactors (i.e., sequentially-configured reactors) and single reactors using bimetallic catalyst systems. Any polyethylene composition regarded as a "multimodal" composition in U.S. Patent No. 6,579,922 is considered to fall within the broad meaning of the term "bimodal polyethylene composition" herein, although important differences exist between the bimodal compositions claimed herein and the bimodal compositions disclosed in that patent. Thus, for example, one embodiment of bimodal composition is a reactor blend (also sometimes referred to as a chemical blend), is one that is formed (polymerized) in a single reactor, e.g., using a bimodal catalyst system (e.g., a dual site catalyst) while at least one other embodiment of a bimodal composition is a physical blend, e.g., a composition formed by the post-polymerization blending or mixing together of two unimodal polyethylene compositions. The term "bimodal catalyst system" includes any composition, mixture or system that includes at least two different catalyst compounds, each having the same or a different metal group but generally different ligands or catalyst structure, including a "dual catalyst." Alternatively, each different catalyst compound of the bimodal catalyst system resides on a single support particle, e.g., in which case a dual catalyst is considered to be a supported catalyst. However, the term bimetallic catalyst also broadly includes a system or mixture in which one of the catalysts resides on one collection of support particles, and another catalyst resides on another collection of support particles. Preferably, in that latter instance, the two supported catalysts are introduced to a single reactor, either simultaneously or sequentially, and polymerization is conducted in the presence of the two collections of supported catalysts. Alternatively, the bimodal catalyst system includes a mixture of unsupported catalysts in slurry form. The term "FI" as used herein means I21, which is measured in accordance with ASTM- 1238, Condition E, at 190 degrees C.
 The term "MFR (I21/I2)" as used herein means the ratio of I21 (also referred to as FI) to h, and both I21 and h are measured in accordance with ASTM- 1238, Condition E, at 190 degrees C.
 The term "high strength" as used herein broadly refers to any one or more of a collection of mechanical properties, e.g., strength-related properties, e.g., properties used to characterize resin used in making pipe, particularly resin that would qualify as PE-80 resin, or PE-100 resin, or preferably PE- 100+ resin. In at least the preferred embodiment, the high strength polyethylene compositions described herein qualify as a PE 100 material, using any of the tests adopted by industry for qualifying a resin in that manner. Preferably, the polyethylene composition is one that, in accordance with ISO 1167: 1996/Cor.1 : 1997(E) (Technical Corrigendum 1, published 1997-03-01), entitled "Thermoplastics pipes for the conveyance of fluids - Resistance to internal pressure - Test method," a pipe formed from the composition that is subjected to internal pipe resistance at selected temperatures has an extrapolated stress of 10 Mpa or greater when the internal pipe resistance curve is extrapolated to 50 or 100 years in accordance with ISO 9080:2003(E). The term "high molecular weight polyethylene component" as used herein means the polyethylene component in the bimodal composition that has a higher molecular weight than the molecular weight of at least one other polyethylene component in the same composition. Preferably, that polyethylene component has an identifiable peak, e.g., as shown in Figure 3. When the composition includes more than two components, e.g., a trimodal composition, then the high molecular weight component is to be defined as the component with the highest weight average molecular weight. In certain embodiments, a high molecular weight component is a component forming a part of the bimodal composition that has a weight average molecular weight (Mw) of from 400,000 to 700,000. In different specific embodiments, the average molecular weight of the high molecular weight polyethylene component may range from a low of 200,000, or 250,000, or 300,000, or 350,000, or 400,000, or 450,000, or 500,000, to a high of 1,000,000, or 900,000, or 800,000, or 700,000, or 600,000. The term "low molecular weight polyethylene component" as used herein means the polyethylene component in the composition that has a lower molecular weight than the molecular weight of at least one other polyethylene component in the same composition. Preferably, that polyethylene component has an identifiable peak, e.g., as shown in Figure 3. When the composition includes more than two components, e.g., a trimodal composition, then the low molecular weight component is to be defined as the component with the lowest weight average molecular weight. In certain embodiments, a low molecular weight component is a component forming a part of the composition that has a weight average molecular weight (Mw) of from 15,000 to 35,000. In different specific embodiments, the average molecular weight of the low molecular weight component may range from a low of 3,000, or 5,000, or 8,000, or 10,000, or 12,000, or 15,000, or 20,000, to a high of 100,000, or 50,000, or 40,000, or 35,000, or 30,000. The term "weight average molecular weight" is a term used to describe a bimodal polyethylene described herein, or to describe a high molecular weight polyethylene component, and a low molecular weight polyethylene component. In either case, the term "average molecular weight" broadly refers to any weight average molecular weight (Mw) as measured or calculated according to any published method, which incorporates procedures, equipment and conditions in ASTM D 3536-91 (1991) and ASTM D 5296-92 (1992). The "overall" number average, weight average, and z-average molecular weight are terms that refer to the molecular weight values for the entire composition, as opposed to that of any individual component. Overall molecular weight values referenced in the claims encompass any value as determined by any published method, including those mentioned in the paragraph above; however, a preferred method is using an SEC curve. In this equation, Y is the weight fraction of polymer corresponding to the molecular species M, Mn is the number average molecular weight of the distribution, and Ao is the weight fraction of the site generating the distribution. Y can be shown to be proportional to the differential molecular weight distribution (DMWD) which is the change in concentration with the change in log-molecular weight. The SEC chromatogram represents the DMWD. Any computer program that minimizes the square of the difference between the experimental and calculated distributions by varying the Ao and Mn for each Flory distribution is preferred. Particularly preferred is any program that can handle up to 8 Flory distributions. A commercially available program, called Excel Solver, offered by Frontline Systems, Inc. (Incline Village, NV 89450, USA) can be used to perform the minimization. Using this program, special constraints can be placed on the individual Flory distributions that allow one to fit chromatograms of experimental blends and bimodal distributions. (n=2,3,4). Although the total number of degrees of freedom is the same for the constrained fit as for eight unconstrained Flory distributions, the presence of the constraint is needed to more accurately determine the contribution to the total chromatogram of the individual low molecular weight and high molecular weight components in a bimodal polymer. Once the fitting process is complete, the program will then calculate the molecular weight statistics and weight percents of the individual high and low molecular weight components. Figure 3 depicts a deconvoluted curve of each individual component. The term "split" is defined herein as the weight % of a high molecular weight component in a bimodal composition. Thus, it describes the relative amount of the high molecular weight component against the low molecular weight component in a bimodal polyethylene composition, including any of the polymer compositions described herein. The weight % of each component can also be represented by the area of each molecular weight distribution curve that is seen after deconvolution of the overall molecular weight distribution curve. The term "spread" as used herein means the ratio of the weight average molecular weight of the high molecular weight polyethylene component, sometimes referred to as MWHMW, to the weight average molecular weight of the low molecular weight polyethylene component, sometimes referred to as MWLMW- The "spread" can therefore be also expressed as the ratio of MWHMW:MWLMW Weight average molecular weight of each component can be obtained by deconvolution of an overall SEC curve, i.e., an SEC curve of an entire composition. As used herein, the term "PDI" means polydispersity index, and means the same thing as "MWD" (molecular weight distribution), which term is understood as having the broadest definition persons in the pertinent art have given that term as reflected in one or more printed publications or issued patents. The PDI (MWD) is the ratio of weight-average molecular weight (Mw) to number-average molecular weight (Mn), i.e., Mw/Mn. As noted below, certain properties or features of the compositions, polymers, pipes, or catalyst systems are expressed in terms of lower limits (e.g., X or greater) or upper limits (e.g., Y or less). It is understood that any of the lower limits can be combined with any of the upper limits, so as to provide a variety of alternative ranges. For any pipe produced from any one of the high strength bimodal polyethylene compositions disclosed herein, when subjected to full hydrostatic strength testing following ISO 1167, the extrapolated stress can be 10 MPa or greater when extrapolated to 50 or 100 years in accordance with ISO 9080:2003(E). Advantageously, a variety of alternative extrapolated stress values are provided. For example, when extrapolated to 50 or 100 years in accordance with ISO 9080:2003(E), the extrapolated stress can be 10.1 MPa or greater, or 10.2 MPa or greater, or 10.3 MPa or greater, or 10.4 MPa or greater, or 10.5 MPa or greater, or 10.6 MPa or greater, or 10.7 MPa or greater, or 10.8 MPa or greater, e.g., up to 15.0 MPa, or any combination of the foregoing upper and lower limits. In any of the compositions described above or elsewhere herein, the melt strength may be greater than 17 cN, greater than 18 cN, greater than 19 cN, greater than 20 cN, greater than 21 cN, greater than 22 cN, greater than 23 cN, greater than 24 cN, greater than 25 cN, 18 cN to 30 cN, or 20 cN to 30 cN, or 22 cN to 30 cN. In any of the compositions described above or elsewhere herein, the high molecular weight polyethylene component may have a density lower limit of 0.920 g/ml or more, or 0.925 g/ml or more, or 0.930 g/ml or more, with a density upper limit of 0.945 g/ml or less, or 0.940 g/ml or less, or 0.935 g/ml or less. In any of the compositions described above or elsewhere herein, the low molecular weight polyethylene component may have a density lower limit of 0.940 g/ml or more, or 0.945 g/ml or more, or 0.950 g/ml or more, with a density upper limit of 0.965 g/ml or less, or 0.960 g/ml or less, or 0.955 g/ml or less. In any of the compositions described above or elsewhere herein, the weight average molecular weight (Mw) of the low molecular weight polyethylene component can be, for example, from 15,000 to 35,000, or any of the ranges spanning between other lower and upper limits disclosed elsewhere herein. In any of the compositions described above or elsewhere herein, the weight average molecular weight (Mw) of the high molecular weight polyethylene component can be, for example, from 400,000 to 700,000, or any of the ranges spanning between other lower and upper limits disclosed elsewhere herein. In any of the compositions described above or elsewhere herein, the high molecular weight polyethylene component can include a polyethylene that includes a comonomer being butene, hexene, octene, and mixtures thereof, wherein the comonomer is present in the amount of 1.0 wt%, or preferably more than 2.0 wt%, or more preferably, more than 3.0 wt% of the polyethylene. In any of the compositions described above or elsewhere herein, the low molecular weight polyethylene component can include a polyethylene that includes a comonomer being butene, hexene, octene, and mixtures thereof, wherein the comonomer is present in the amount of 3.0 wt%, or preferably less than 2.0 wt %, or more preferably, less than 1.0 wt% of the polyethylene. In one or more of the high strength compositions disclosed herein, the weight % of high molecular weight polyethylene component, can occupy 45 wt% or more of the composition, also termed the "split" as discussed above. In alternative embodiments, the high molecular weight polyethylene component can occupy 46 wt% or more, 47 wt% or more, 48 wt% or more, 49 wt% or more, or 50 wt% or more of the composition. Conversely, in any of those aforementioned high strength compositions, the high molecular weight polyethylene component can occupy 60 wt% or less of the composition, or 59 wt% or less, 58 wt% or less, 57 wt% or less, 56 wt% or less, 55 wt% or less, 54 wt% or less, 53 wt% or less, or 52 wt% or less, or any combination of the foregoing upper and lower limits. In certain embodiments, the split is 45 wt% to 60 wt%, 48 wt% to 56 wt%, 50 wt% to 52 wt%, or 51 wt%. In one or more of the high strength compositions disclosed herein, the spread, the ratio of MWHMVΛMWLMW as defined previously, can be 15 or more, 17 or more, 19 or more, 21 or more, 40 or less, 36 or less, 32 or less, 28 or less, 25 or less, or any combination of the foregoing upper and lower limits, or 15 to 40, 17 to 35, 19 to 29, 21 to 23, or 22. In one or more of the high strength compositions disclosed herein, the FI (I21) of the composition can range from 4 to 10 g/10 min. In alternative embodiments, the FI can be expressed as having any one of a number of ranges, e.g., with a lower limit of 4 g/10 min or above, or 5 g/10 min or above, or 6 g/10 min or above, or 7 g/10 min or above, or 8 g/10 min or above, or 9 g/10 min or above; together with an upper limit of 10 g/10 min or below, or 9 g/10 min or below, or 8 g/10 min or below, or 7 g/10 min or below, or 6 g/10 min or below, or 5 g/10 min or below, or any combination of the foregoing upper and lower limits. In one embodiment, the FI is 4 to 10 g/10 min. In one or more of the high strength compositions disclosed herein, the MFR (I21/I2) can range from 100 to 250. In alternative embodiments, the MFR can be expressed as having any one of a number of ranges, e.g., with a lower limit of 50, or 60, or 70, or 80, or 90, or 100, or 110, or 120, or 130, or 140, or 150; together with an upper limit of 150, or 180, or 200, or 220, or 250, or 270, or 300, or 320, or 350, or any combination of the foregoing upper and lower limits. In one or more of the high strength compositions disclosed herein, the PDI of the overall composition can be expressed as having any one of a number of ranges, e.g., with a lower limit of 10, or 15; together with an upper limit of 45 or less, or 40 or less, or 35 or less, or 30 or less, or 25 or less or any combination of the foregoing upper and lower limits. In certain embodiments, the PDI can be 15 to 40, or 17 to 31, or 19 to 22, or 20. In one or more of the high strength compositions disclosed herein, the PDI of the high molecular weight component can be greater than 3.5. In alternative embodiments, the PDI of the high molecular weight component can be expressed as having any one of a number of ranges, e.g., with a lower limit of 3.0 or more, or 3.5 or more, or 4.0 or more, or 4.5 or more, or 5.0 or more, or 5.5 or more or 6.0 or more, together with an upper limit of 6.0 or less, or a combination of the foregoing upper and lower limits. In one or more of the high strength compositions disclosed herein, the PDI of the low molecular weight component can be 2.5 or more. In alternative embodiments, the PDI of the low molecular weight component can be expressed as having any number of ranges, e.g., with a lower limit of 2.0 or more, or 2.5 or more, or 3.0 or more, or 3.5 or more, or; together with an upper limit of 5.0 or less, or 4.5 or less, or 4.0 or less, or 3.5 or lesser any combination of the foregoing upper and lower limits. In one or more of the high strength compositions disclosed herein, the average molecular weight of the overall composition can be 200,000 or more. In alternative embodiments, the average molecular weight of the overall composition can be expressed as having any one of a number of ranges, e.g., with a lower limit of 50,000 or more, or 100,000 or more, or 150,000 or more, or 200,000 or more, or 250,000 or more, or 300,000 or more, or 350,000 or more, or 400,000 or more, or 450,000 or more; together with an upper limit of 1,000,000 or less, or 900,000 or less, or 850,000 or less, or 800,000 or less, or 750,000 or less, or 700,000 or less, or 650,000 or less, or 600,000 or less, or 550,000 or less, or 500,000 or less, or 450,000 or less, or 400,000 or less or any combination of the foregoing upper and lower limits. In one or more of the high strength compositions disclosed herein, the average molecular weight (Mw) of the low molecular weight component is preferably 15,000 or more; or 18,000 or more; or 22,000 or more; and is preferably 35,000 or less; or 32,000 or less; or 28,000 or less, or ranges represented by any combination of the foregoing upper and lower limits. In certain embodiments, the Mw of the low molecular weight component can be 15,000 to 35,000, or 25,000. In one or more of the high strength compositions disclosed herein, the high and low molecular weight polyethylene components can be formed in a single reactor. Examples of such reactors are disclosed elsewhere herein in greater detail. In one or more of the high strength compositions disclosed herein, the high and low molecular weight polyethylene components can be formed in gas phase polymerization. Details of useful gas phase polymerizations are described elsewhere herein. One or more of the high strength compositions disclosed herein can be made from polymerization conducted in the presence of a bimodal catalyst system that includes a metallocene based catalyst. In one or more of the high strength compositions disclosed herein, the high and low molecular weight polyethylene components can be formed from polymerization conducted in the presence of a bimodal catalyst system that includes bis(2-(trimethylphenylamido)ethyl)amine zirconium dibenzyl. In one or more of the high strength compositions disclosed herein, the high and low molecular weight polyethylene components can be formed from polymerization conducted in the presence of a bimodal catalyst system that includes bis(2-(pentamethylphenylamido)ethyl)amine zirconium dibenzyl. In one or more of the high strength compositions disclosed herein, the high and low molecular weight polyethylene components can be formed from polymerization conducted in the presence of a bimodal catalyst system that includes (pentamethylcyclopentadienyl)(n-propylcyclopentadienyl)zirconium dichloride. In one or more of the high strength compositions disclosed herein, the high and low molecular weight polyethylene components can be formed from polymerization conducted in the presence of a bimodal catalyst system that includes (tetramethylcyclopentadienyl)(n-propylcyclopentadienyl)zirconium dichloride or (tetramethylcyclopentadienyl)(n-propylcyclopentadienyl)zirconium dimethyl. In one or more of the high strength compositions disclosed herein, the high and low molecular weight polyethylene components can be formed from polymerization conducted in the presence of a bimodal catalyst system that includes bis(n-butylcyclopentadienyl)zirconium dichloride or bis(n- butylcyclopentadienyl)zirconium dimethyl. As noted above, the high strength bimodal polyethylene composition preferably has a density of 0.940 g/cc or more, and includes (and in certain embodiments consists or consists essentially of) a high molecular weight polyethylene component having a higher weight average molecular weight (MWHMW) and a low molecular weight polyethylene component having a lower weight average molecular weight (MWLMW), wherein: the composition qualifies as a PE 100 material such that in accordance with ISO 1167 a pipe formed from the composition that is subjected to internal pipe resistance has an extrapolated stress of 10 MPa or more when the internal pipe resistance curve is extrapolated to 50 or 100 years in accordance with ISO 9080:2003(E); and the melt strength is greater than 18 cN. As noted in the discussion of the specific embodiments; likewise, the extrapolated stress can be higher, and is preferably 10.5 MPa or higher, and even 10.7 MPa or higher. In at least one particular embodiment, a composition includes a bimodal polyethylene composition prepared using any of the catalyst systems described above but, not limited to those illustrated herein. As noted above, the bimodal polyethylene compositions preferably have a high molecular weight component and a low molecular weight component. Preferably, the high molecular weight component has a lower density than the density of the low molecular weight component. Also, the high molecular weight component preferably has a higher comonomer content than the comonomer content of the low molecular weight component. The comonomer content can be expressed as the number of comonomer branches per 1000 carbon atoms. In certain embodiments, the number of comonomer branches per 1000 carbon atoms for the low molecular weight component is between 0 and 2, preferably 1 or less. In certain embodiments, the number of comonomer branches per 1000 carbon atoms for the high molecular weight component is 2 to 5, preferably more than 2, or more preferably, more than 3. The polymerization process used to form any of the polymers described herein, may be carried out using any suitable process, for example, high pressure, solution, slurry and gas phase. Certain polyethylenes can be made using a gas phase polymerization process, e.g., utilizing a fluidized bed reactor. This type reactor and means for operating the reactor are well known and completely described in, for example, US 3,709,853; 4,003,712; 4,011,382; 4,302,566; 4,543,399; 4,882,400; 5,352,749; 5,541,270; EP-A- 0 802 202 and Belgian Patent No. 839,380. These patents disclose gas phase polymerization processes wherein the polymerization medium is either mechanically agitated or fluidized by the continuous flow of the gaseous monomer and diluent. A polymerization process may be effected as a continuous gas phase process such as a fluid bed process. A fluid bed reactor may comprise a reaction zone and a so-called velocity reduction zone. The reaction zone may comprise a bed of growing polymer particles, formed polymer particles and a minor amount of catalyst particles fluidized by the continuous flow of the gaseous monomer and diluent to remove heat of polymerization through the reaction zone. Optionally, some of the re-circulated gases may be cooled and compressed to form liquids that increase the heat removal capacity of the circulating gas stream when readmitted to the reaction zone. A suitable rate of gas flow may be readily determined by simple experiment. Make up of gaseous monomer to the circulating gas stream is at a rate equal to the rate at which particulate polymer product and monomer associated therewith is withdrawn from the reactor and the composition of the gas passing through the reactor is adjusted to maintain an essentially steady state gaseous composition within the reaction zone. The gas leaving the reaction zone is passed to the velocity reduction zone where entrained particles are removed. Finer entrained particles and dust may optionally be removed in a cyclone and/or fine filter. The gas is passed through a heat exchanger wherein the heat of polymerization is removed, compressed in a compressor and then returned to the reaction zone. The reactor temperature of the fluid bed process herein preferably ranges from 300C or 400C or 500C to 900C or 1000C or 1100C or 1200C In general, the reactor temperature is operated at the highest temperature that is feasible taking into account the sintering temperature of the polymer product within the reactor. Regardless of the process used to make the polyolefins of the invention, the polymerization temperature, or reaction temperature should be below the melting or "sintering" temperature of the polymer to be formed. Thus, the upper temperature limit in one embodiment is the melting temperature of the polyolefin produced in the reactor. A slurry polymerization process can also be used. A slurry polymerization process generally uses pressures in the range of from 1 to 50 atmospheres and even greater and temperatures in the range of 00C to 1200C, and more particularly from 300C to 1000C. In a slurry polymerization, a suspension of solid, particulate polymer is formed in a liquid polymerization diluent medium to which ethylene and comonomers and often hydrogen along with catalyst are added. The suspension including diluent is intermittently or continuously removed from the reactor where the volatile components are separated from the polymer and recycled, optionally after a distillation, to the reactor. The liquid diluent employed in the polymerization medium is typically an alkane having from 3 to 7 carbon atoms, a branched alkane in one embodiment. The medium employed should be liquid under the conditions of polymerization and relatively inert. When a propane medium is used the process must be operated above the reaction diluent critical temperature and pressure. In one embodiment, a hexane, isopentane or isobutane medium is employed. Also useful is particle form polymerization, a process where the temperature is kept below the temperature at which the polymer goes into solution. Other slurry processes include those employing a loop reactor and those utilizing a plurality of stirred reactors in series, parallel, or combinations thereof. Non-limiting examples of slurry processes include continuous loop or stirred tank processes. Also, other examples of slurry processes are described in US 4,613,484 and 2 Metallocene-Based Polyolefins 322-332 (2000). These processes can be used for the production of homopolymers of olefins, particularly ethylene, and/or copolymers, terpolymers, and the like, of olefins, particularly ethylene, and at least one or more other olefin(s). Preferably the olefins are α-olefms. The olefins, for example, may contain from 2 to 16 carbon atoms in one embodiment; and in another embodiment, ethylene and a comonomer comprising from 3 to 12 carbon atoms in another embodiment; and ethylene and a comonomer comprising from 4 to 10 carbon atoms in yet another embodiment; and ethylene and a comonomer comprising from 4 to 8 carbon atoms in yet another embodiment. Particularly preferred are poly ethylenes. Such polyethylenes are preferably homopolymers of ethylene and interpolymers of ethylene and at least one α-olefin wherein the ethylene content is at least about 50% by weight of the total monomers involved. Exemplary olefins that may be utilized herein are ethylene, propylene, 1-butene, 1-pentene, 1-hexene, 1-heptene, 1-octene, 4-methylpent-l-ene, 1-decene, 1-dodecene, 1-hexadecene and the like. Also utilizable herein are polyenes such as 1,3-hexadiene, 1,4-hexadiene, cyclopentadiene, dicyclopentadiene, 4-vinylcyclohex-l-ene, 1,5-cyclooctadiene, 5-vinylidene-2-norbornene and 5-vinyl-2-norbornene, and olefins formed in situ in the polymerization medium. When olefins are formed in situ in the polymerization medium, the formation of polyolefins containing long chain branching may occur. In the production of polyethylene or polypropylene, comonomers may be present in the polymerization reactor. When present, the comonomer may be present at any level with the ethylene or propylene monomer that will achieve the desired weight percent incorporation of the comonomer into the finished resin. In one embodiment of polyethylene production, the comonomer is present with ethylene in a mole ratio range of from 0.0001 (comonomer: ethylene) to 50, and from 0.0001 to 5 in another embodiment, and from 0.0005 to 1.0 in yet another embodiment, and from 0.001 to 0.5 in yet another embodiment. Expressed in absolute terms, in making polyethylene, the amount of ethylene present in the polymerization reactor may range to up to 1000 atmospheres pressure in one embodiment, and up to 500 atmospheres pressure in another embodiment, and up to 200 atmospheres pressure in yet another embodiment, and up to 100 atmospheres in yet another embodiment, and up to 50 atmospheres in yet another embodiment. Hydrogen gas is often used in olefin polymerization to control the final properties of the polyolefin, such as described in Polypropylene Handbook 76-78 (Hanser Publishers, 1996). Using certain catalyst systems, increasing concentrations (partial pressures) of hydrogen can increase the melt flow rate (MFR) (also referred to herein as melt index (MI)) of the polyolefin generated. The MFR or MI can thus be influenced by the hydrogen concentration. The amount of hydrogen in the polymerization can be expressed as a mole ratio relative to the total polymerizable monomer, for example, ethylene, or a blend of ethylene and hexene, propene, pentene, octene, and mixtures thereof. The amount of hydrogen used in the polymerization process of the present invention is an amount necessary to achieve the desired MFR or MI of the final polyolefin resin. In one embodiment, the mole ratio of hydrogen to total monomer (H2:monomer) is in a range of from greater than 0.0001 in one embodiment, and from greater than 0.0005 in another embodiment, and from greater than 0.001 in yet another embodiment, and less than 10 in yet another embodiment, and less than 5 in yet another embodiment, and less than 3 in yet another embodiment, and less than 0.10 in yet another embodiment, wherein a desirable range may comprise any combination of any upper mole ratio limit with any lower mole ratio limit described herein. Expressed another way, the amount of hydrogen in the reactor at any time may range to up to 5000 ppm, and up to 4000 ppm in another embodiment, and up to 3000 ppm in yet another embodiment, and between 50 ppm and 5000 ppm in yet another embodiment, and between 500 ppm and 2000 ppm in another embodiment. Further, it is common to use a staged reactor employing two or more reactors in series, wherein one reactor may produce, for example, a high molecular weight component and another reactor may produce a low molecular weight component. In one embodiment of the invention, the polyolefin is produced using a staged gas phase reactor. Such commercial polymerization systems are described in, for example, 2 Metallocene-Based Polyolefins 366-378 (John Scheirs & W. Kaminsky, eds. John Wiley & Sons, Ltd. 2000); US 5,665,818, US 5,677,375; US 6,472,484; EP 0 517 868 and EP-A-O 794 200. The one or more reactor pressures in a gas phase process (either single stage or two or more stages) may vary from 100 psig (690 kPa) to 500 psig (3448 kPa), and in the range of from 200 psig (1379 kPa) to 400 psig (2759 kPa) in another embodiment, and in the range of from 250 psig (1724 kPa) to 350 psig (2414 kPa) in yet another embodiment. The gas phase reactor employing the catalyst system described herein is capable of producing from 500 lbs of polymer per hour (227 Kg/hr) to 200,000 lbs/hr (90,900 Kg/hr), and greater than 1000 lbs/hr (455 Kg/hr) in another embodiment, and greater than 10,000 lbs/hr (4540 Kg/hr) in yet another embodiment, and greater than 25,000 lbs/hr (11,300 Kg/hr) in yet another embodiment, and greater than 35,000 lbs/hr (15,900 Kg/hr) in yet another embodiment, and greater than 50,000 lbs/hr (22,700 Kg/hr) in yet another embodiment, and from 65,000 lbs/hr (29,000 Kg/hr) to 100,000 lbs/hr (45,500 Kg/hr) in yet another embodiment. A slurry or gas phase process can be operated in the presence of a metallocene-type catalyst system and in the absence of, or essentially free of, any scavengers, such as triethylaluminum, trimethylaluminum, tri-isobutylaluminum and tri-n-hexylaluminum and diethyl aluminum chloride, dibutyl zinc and the like. By "essentially free", it is meant that these compounds are not deliberately added to the reactor or any reactor components, and if present, are present to less than 1 ppm in the reactor. One or all of the catalysts can be combined with up to 10 wt% of a metal-fatty acid compound, such as, for example, an aluminum stearate, based upon the weight of the catalyst system (or its components), such as disclosed in US 6,300,436 and 5,283,278. Other suitable metals include other Group 2 and Group 5-13 metals. In an alternative embodiment, a solution of the metal-fatty acid compound is fed into the reactor. In yet another embodiment, the metal-fatty acid compound is mixed with the catalyst and fed into the reactor separately. These agents may be mixed with the catalyst or may be fed into the reactor in a solution or a slurry with or without the catalyst system or its components. Supported catalyst(s) can be combined with the activators and are combined, such as by tumbling and other suitable means, with up to 2.5 wt% (by weight of the catalyst composition) of an antistatic agent, such as an ethoxylated or methoxylated amine, an example of which is Kemamine AS-990 (ICI Specialties, Bloomington Delaware). It is to be understood that while the invention has been described in conjunction with the specific embodiments thereof, the foregoing description is intended to illustrate and not limit the scope of the invention. Other aspects, advantages and modifications will be apparent to those skilled in the art to which the invention pertains. Therefore, the following examples are put forth so as to provide those skilled in the art with a complete disclosure and description of how to make and use the compounds of the invention, and are not intended to limit the scope of that which the inventors regard as their invention. The following examples discuss some properties and other characteristics of bimodal polyethylene compositions that qualify as a PE 100 material and have, among other things, surprisingly high melt strength. Table 1. Properties of a composition according to an embodiment of the instant invention and of four commercial compositions. Qenos Pty Ltd., Altona, Victotia, Australia. Atofina XSlOH ™ is available from Arkema Canada, Oakville, Ontario, Canada. Borealis HE3490™ and Borialis HE3490 LS ™ are available from Borealis Polymers Oy, Porvoo, Finland ("LS" refers to "Low Sag"). CRP 100 Pipe™ is available from LyondellBasell Industries, Rotterdam, The Netherlands. Table 2. Properties of a composition according to an embodiment of the instant invention and of four commercial compositions. Figure 1 is a graph showing the dynamic viscosity of three samples according to embodiments of the instant invention (all designated as 1163-18-1 since the same conditions were present, the samples being taken at different times) and of five commercial samples. Dynamic viscosity was measured using a Rheometrics (Piscatway, NJ, U.S.) dynamic stress rheometer, model SR-200 at 1900C and at a shearing rate range of 0.01 to 100 s"1. Figure 2 is a graph showing the Rheotens melt strength versus pull-off speed for two samples according to embodiments of the instant invention and of four commercial samples. Melt strength was measured using a GottFert (Rock Hill SC, U.S.) Rheo-Tester 2000 under the following conditions: Instrument: Gottfert Rheo-Tester 2000; test temperature: 1900C; die length/diameter: 20 mm/2mm; barrel diameter: 15 mm; start speed: 9.5 mm/s; acceleration: 2.4 mm/s2; strand length between die and rollers: 130 mm; and gap between rollers: 0.5 mm. Compounded granular samples of Bimodal Product resin were prepared, on Kobe LCM-100 compounding line (Kobe Steel, Ltd., Hyogo Japan) equipped with EL-2 rotors, using compounding additives, namely, 2,000 ppm of B-225 (Irganox™ 1010 and Irgafos™ 168 in a 1 : 1 ratio) and 500 ppm of CaSt. Carbon black was incorporated at 2.25 wt % through a masterbatch. The resulting pellet samples were measured for flow properties, density, and Size Exclusion Chromatography (SEC), as discussed below. Table 4 presents flow properties of two samples of Bimodal Product. Sample 1163-18-1 was a Bimodal Product compounded without carbon black, a natural grade (NG) bimodal product produced from a dry catalyst system (identified above). Sample 1163-18-1 BK was a bimodal product that included black compounds but was otherwise identical to Sample 1163-18-1. The black compounds were masterbatches containing carbon black. Note that addition of black compounds had little impact on the overall flow properties, but density increased about 0.01 g/cc and resulted in a density of approximately 0.9597 g/cc. Figure 3 shows a molecular weight distribution (MWD) curve taken of the Bimodal Product (sample 1163-18-1) using the SEC technique described herein (GPC method), which reveals two peaks, one of which corresponds to a relatively low molecular weight component, the other corresponding to a high molecular weight component. Table 5 below shows molecular data from SEC and its deconvolution results for these samples. The overall Mw's range from approximately 312,000 to 415,000 and the overall Mn' s range from approximately 13,000 to 14,500. Overall polydispersity (PDI) was 23.4 to 28.5. The HMW component weight %, or split, was 52-53 wt%, and the PDI of the HMW component was 4.7. The "spread," i.e., the ratio of MWHMW to MWLMW, was 22.6. The slow crack growth performance was tested using the notched pipe test, ISO 13479. The notched pipe SCG test was 4 inch SDRI l pipe. The test conditions used were 800C and 9.2 bars pressure. The average failure time for three specimens of sample 1163-18-1 was 3,672 hrs, exceeding the PE-100 requirement of >500 hrs. Test specimens of specific dimensions for Pennsylvania notch test (PENT) and Charpy impact test were prepared for sample 1163-18-1. PENT (ASTM F1473-94) is a lab-scale screening test with small specimens to predict the resistance of slow crack growth of pipes. Samples of the Bimodal Product, in pellet resin form, were compression molded to make plaques for PENT in accordance with the ASTM standard. From the plaques, three rectangular specimens were milled, cut and then placed onto PENT test stations. Two specimens made from the same batch of Bimodal Product sample 1163-18-1 lasted between 1,800 and 2,600 hrs. Then, pipes were extruded for purposes of a long-term hydrostatic test in an external test laboratory. The pipe extruder was a Maplan model SS60-30. The molten pipe profile coming out of an annular die was drawn down from the die-gap opening into the interior of the sizing sleeve by a puller located further downstream. As pipe moved through the sizing sleeve, a vacuum pulled the molten profile against the interior of the sleeve. Cooling water entered the compartment, cooling the pipe and maintaining established dimensions. Nominal 32mm SDR 11 pipes of high quality with smooth surface were produced. Standardized internal pressure tests for plastic pipe are set forth in ISO 1167 entitled "Thermoplastic pipes for the conveyance of fluids - Resistance to internal pressure - Test method." The test specifies a method for determination of the resistance to constant internal pressure at constant temperature. The test requires that samples be kept in an environment at a specific temperature, which can be water ("water-in-water" test), another liquid ("water-in-liquid") or air ("water-in-air" test). Hydrostatic testing was performed, as described in ISO 4437, table 8 following ISO 1167. This test is a short-term screening hydrostatic pressure test being conducted at three specific hydrostatic conditions. ISO 4437 specifies three specific criteria for PE-80 and PE-100 resins. The tests were performed on 32 mm SDR 11 pipes (3 mm thickness) as "water-in-water" test. In terms of pipe length, the standard requires at least three times the outside diameter. In our case, the length of pipe was 350 mm. Pipe specimens made from Bimodal Product (sample 1163-18-1, which includes carbon black, called sample 1163-18-1 BK) were subjected to the three conditions required for PE-100. 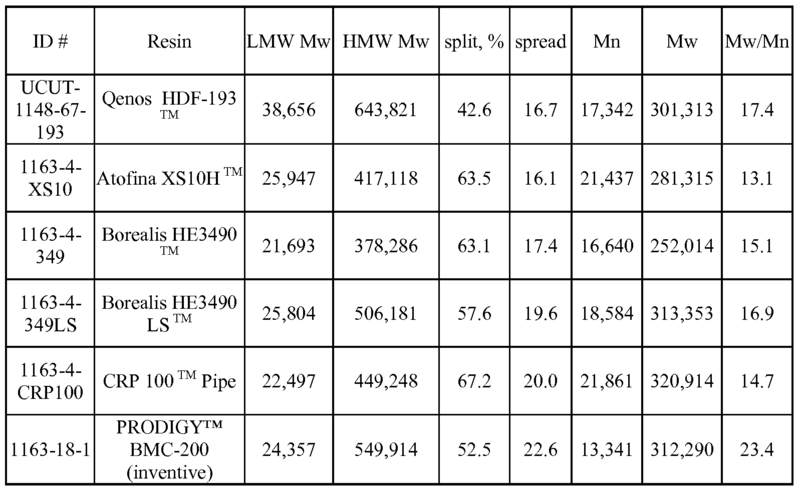 Table 6 reveals the test results for short- term hydrostatic strength tests as described in ISO 4437 following ISO 1167 for pipe specimens made from sample 1163-18-1 BK. It should be noted that, for all the cases, sample 1163-18-1 BK far exceeded the failure-time criteria for PE-100 that is specified in ISO 4437. The phrases, unless otherwise specified, "consists essentially of and "consisting essentially of do not exclude the presence of other steps, elements, or materials, whether or not, specifically mentioned in this specification, so long as such steps, elements, or materials, do not affect the basic and novel characteristics of the invention, additionally, they do not exclude impurities and variances normally associated with the elements and materials used. For the sake of brevity, only certain ranges are explicitly disclosed herein. However, ranges from any lower limit may be combined with any upper limit to recite a range not explicitly recited, as well as, ranges from any lower limit may be combined with any other lower limit to recite a range not explicitly recited, in the same way, ranges from any upper limit may be combined with any other upper limit to recite a range not explicitly recited. Additionally, within a range includes every point or individual value between its end points even though not explicitly recited. Thus, every point or individual value may serve as its own lower or upper limit combined with any other point or individual value or any other lower or upper limit, to recite a range not explicitly recited. All priority documents are herein fully incorporated by reference for all jurisdictions in which such incorporation is permitted and to the extent such disclosure is consistent with the description of the present invention. Further, all documents and references cited herein, including testing procedures, publications, patents, journal articles, etc. are herein fully incorporated by reference for all jurisdictions in which such incorporation is permitted and to the extent such disclosure is consistent with the description of the present invention. While the invention has been described with respect to a number of embodiments and examples, those skilled in the art, having benefit of this disclosure, will appreciate that other embodiments can be devised which do not depart from the scope and spirit of the invention as disclosed herein. the composition has a melt strength of 18 cN or greater. 2. The composition of claim 1 wherein the high and low molecular weight polyethylene components are formed in a single reactor. 3. The composition of any one of the preceding claims in which the melt strength is greater than 20 cN. 4. The composition any one of the preceding claims in which the melt strength is greater than 22 cN. 5. The composition of any one of the preceding claims in which the complex viscosity at 0.01 s-1 is greater than 3.5* 105 Pa-s.
6. The composition of any one of the preceding claims in which the complex viscosity at 0.1 s-1 is greater than 1.5*105 Pa-s.
7. The composition of any one of the preceding claims having an overall PDI of 15 to 40. 8. The composition of any one of the preceding claims in which the high molecular weight component is present in an amount of 45 to 60 wt. %. 9. The composition of any one of the preceding claims in which the average molecular weight (Mw) of the low molecular weight polyethylene component is from 5,000 to 35,000. 10. The composition of any one of the preceding claims in which the average molecular weight (Mw) of the high molecular weight polyethylene component is from 400,000 to 700,000. 11. The composition of any one of the preceding claims in which the ratio of the weight average molecular weight of high molecular weight component to the weight average molecular weight of low molecular weight component (MwHMW:MwLMW) is 15 to 40 : 1. 12. The composition of any one of the preceding claims having an FI (121) of from 4 to 10 g/10 min. 13. The composition of any one of the preceding claims in which the high molecular weight polyethylene component has a density of 0.945 or less. 14. The composition of any one of the preceding claims in which the low molecular weight polyethylene component has a density of 0.940 or more. 15. The composition of any one of the preceding claims in which the high molecular weight polyethylene component comprises a polyethylene that comprises a comonomer being butene, hexene, octene, and mixtures thereof, wherein the comonomer is present in the amount of more than 1.0 wt% of the polyethylene. 16. The composition of any one of the preceding claims in which the low molecular weight polyethylene component comprises a polyethylene that comprises a comonomer being butene, hexene, octene, and mixtures thereof, wherein the comonomer is present in the amount of less than 3.0 wt% of the polyethylene. 17. The composition of any one of the preceding claims wherein the extrapolated stress is 10.5 MPa or more when extrapolated to 50 or 100 years in accordance with ISO 9080:2003(E). 18. The composition of any one of the preceding claims or any one of claims 20-25 wherein the high and low molecular weight polyethylene components are formed in gas phase polymerization. 19. The composition of any one of claims 1-17 or 20-25 wherein the high and low molecular weight polyethylene components are formed in slurry phase polymerization. 20. The composition of any one of the preceding claims wherein the composition is made from polymerization conducted in the presence of a bimodal catalyst system that comprises a metallocene based catalyst. 21. The composition of any one of the preceding claims wherein the high and low molecular weight polyethylene components are formed from polymerization conducted in the presence of a bimodal catalyst system that comprises bis(2- trymethylphenylamido)ethyl)amine zirconium dibenzyl. 22. The composition of any one of the preceding claims wherein the high and low molecular weight polyethylene components are formed from polymerization conducted in the presence of a bimodal catalyst system that comprises bis(2- (pentamethyl-phenylamido)ethyl)amine zirconium dibenzyl. 23. The composition of any one of the preceding claims wherein the high and low molecular weight polyethylene components are formed from polymerization conducted in the presence of a bimodal catalyst system that comprises (pentamethylcyclopentadienylX n-propylcyclopentadienyl) zirconium dichloride. 24. The composition of any one of the preceding claims wherein the high and low molecular weight polyethylene components are formed from polymerization conducted in the presence of a bimodal catalyst system that comprises (tetramethylcyclopentadienyl)(n-propylcyclopentadienyl)zirconium dichloride or (tetramethylcyclopentadienyl)(n-propylcyclopentadienyl)zirconium dimethyl. 25. The composition of any one of the preceding claims wherein the high and low molecular weight polyethylene components are formed from polymerization conducted in the presence of a bimodal catalyst system that comprises bis(2- pentamethylphenylamido)ethyl)zirconium dibenzyl or bis(2- pentamethylphenylamido)ethyl)zirconium dimethyl. MX2010013371A MX2010013371A (en) 2008-07-16 2009-07-07 Polyethylene compositions.